Cheer Athletics Swooshcats claimed back to back World Championship titles in 2016 and 2017. In 2018, Prodigy All-Stars made history as they won their program's first ever World Championship title in the division with Blacklight. At Worlds, 2018, Prodigy All Stars Blacklight brought the gold globe home to Houston, TX! They started as underdogs but ended as unforgettable champions. Blacklight made history at The Cheerleading Worlds 2018 by winning their first-ever World Championship title. 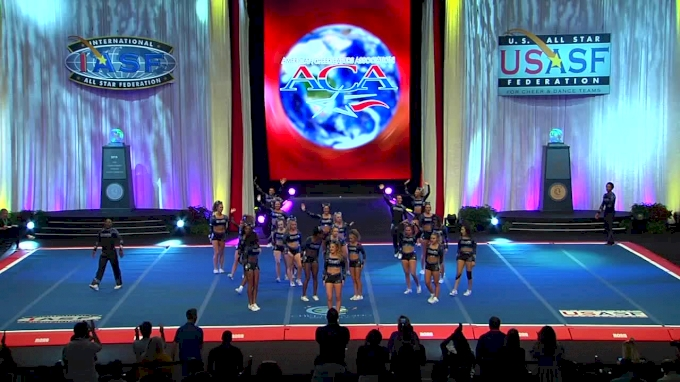 Cheer Athletics Swooshcats has established a strong reputation in the IOSC division. Swooshcats were the 2017 World Champions in this division but fell short to Blacklight last season. Swooshcats are ready for the opportunity to relive that magical moment of hearing their name announced as the Level 5 International Open Small Coed World Champions again. 2018 was the first season for Brandon All Stars Smoke and the new team came out strong with a top three placement at The Cheerleading Worlds. Smoke features multiple Brandon Senior Black alumni who know a thing two about what it takes to bring home the gold. Here’s a look back at some of the winners from the Level 5 International Open Small Coed division from some of this season's major events! Will these teams medal at The Cheerleading Worlds 2019? We can’t wait to watch these incredible teams take the Worlds mat! Year after year, the International Open Small Coed 5 division continues to be a crowd favorite and 2019 has been no different. FAME All Stars Finale claimed one of the first major titles of the season topping the IOSC5 division at CHEERSPORT Nationals in Atlanta, Georgia. Finale's impressive performance at CHEERSPORT earned them an At-Large Bid to Worlds! The reigning Level 5 International Open Small Coed World Champions, Prodigy All Stars Blacklight, hit the ground running this season and blew away the competition at NCA. They ended the weekend with an NCA title, black jackets and an impressive score of 99.2488. Don't miss your chance to watch Blacklight defend their title LIVE at The Cheerleading Worlds! Top Gun All Stars are no strangers to standing on the podium at The Cheerleading Worlds. This season, they've added another Worlds team to their program, Sci5. This group of talented athletes will compete to make a name for themselves as they compete for the first time at Worlds. Sci5 earned a National Championship title at UCA All Star Nationals and now they will return to Orlando looking to repeat their success! Sci5 has a pyramid that is out of this world! Watch as they slow down their pyramid before kicking it into overdrive to finish their routine! Who will take home the International Open Small Coed 5 title in 2019? Be sure to watch these teams take the floor LIVE!